Plastic 16 oz. 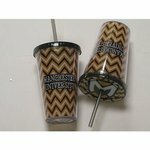 double wall insulated acrylic chevron patterned tumbler. Full color Manchester University graphic on both sides and crest on the lid.